Individuals and professionals can leave this town’s Household Hazardous Waste Facility, which Minkalis supervises, with up to 10 gallons of recycled paint without paying a cent. With the U.S. Environmental Protection Agency estimating that about 10 percent of house paint purchased each year – between 65 million and 69 million gallons – goes unused, recycling is one way Gilbert and some other communities are trying to keep that paint out of landfills. Since it opened in 2007, the facility has recycled more than 44,000 gallons of paint, he said. “We’re helping people clean out their garage; they’re not storing it up,” said Rick Neiner Sr., a technician at the facility. 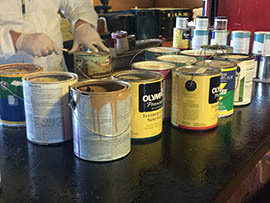 While oil-based paint, which is commonly used on the exterior of structures, is disposed of as hazardous waste, technicians sort through donated containers of latex paint to determine which are suitable for recycling. Paint that’s lumpy or moldy or smells like it’s gone bad is put in drums headed to a Riverside, California, company that mixes it with sawdust and wood to make fuel and other products such as binders and agents that control dust in the manufacture of cement. Paint that’s smooth is strained and mixed together in 55-gallon drums, then poured into 5-gallon containers. The color almost always winds up gray or tan, though the exact shade in a container will vary. During winter and spring months when painting is more popular, there usually is a waiting list that can be weeks-long. At other times, it’s possible to drive up and leave with 10 gallons during the facility’s hours: 9 a.m. to 3 p.m. Wednesdays and Fridays and 7 a.m. to 1 p.m. Saturdays. The facility also partners with Habitat for Humanity and Gilbert Cares to donate paint to families whose homes need it. According to PaintCare, a nonprofit organization created by paint manufacturers, nine states including California, Colorado and Oregon have what it calls “paint stewardship” programs that promote paint recycling. In California, for example, a fee added to paint purchases helps cover the cost of retailers taking back and recycling paint. Arizona isn’t among those states, but PaintCare’s website says the organization hopes to add several states to the list soon. “Any state that is interested, we are ready to build a stewardship with,” said Paul Fresina, director of communications and operations for PaintCare. Since 2008, Arizona State University has reused paint left over from campus projects by offering it to students and departments that need it, said Roseann Barton, supervisor at ASU’s Paint Services. In addition to the university not having to pay to have unused paint picked up, Barton said the broader community benefits because leftover paint isn’t going into landfills. “I never knew where the paint was getting picked up and taken to, so I thought it would be better to use it and have someone benefit,” she said. Gilbert’s Household Hazardous Waste Facility is about more than just paint. Also taking in e-waste, cleaning supplies, antifreeze, pesticides and other hazardous waste, Minkalis, the supervisor, said the facility recycles 92 percent of everything it receives. Karen Miller, a homeowner, dropped by on a recent weekday to see what she could take home. Minkalis said another way to keep paint out of the waste stream is buying the right amount for a job. The U.S. Environmental Protection Agency says nearly 70 million gallons of unused house paint is left over each year. 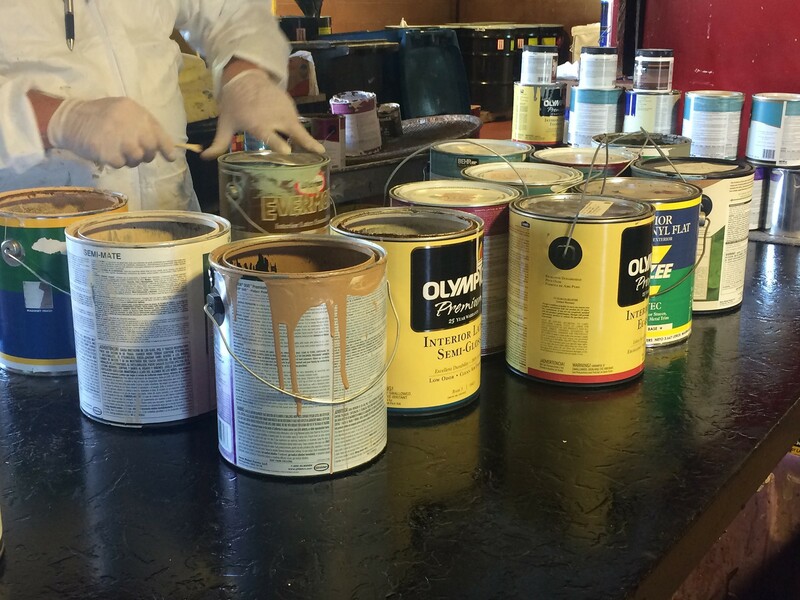 Gilbert is taking on the problem by recycling latex paint and offering it for free. 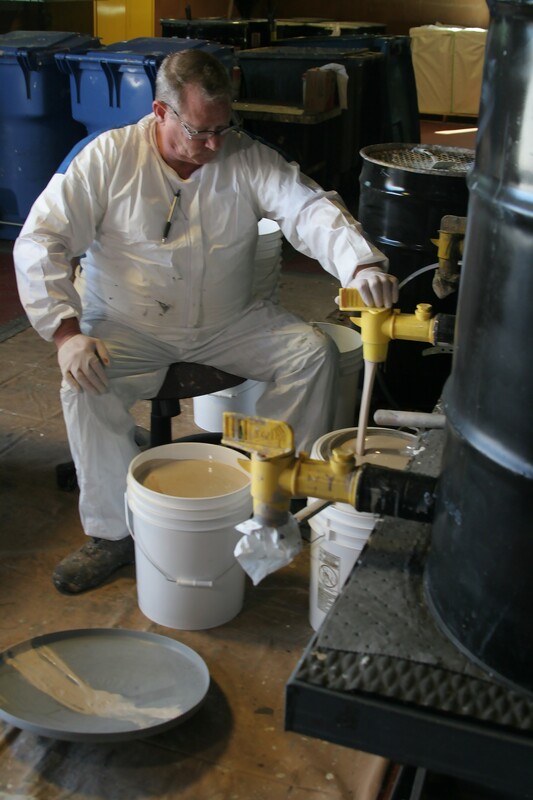 A technician reviews paint turned in to Gilbert’s Household Hazardous Waste Facility. Rick Neiner Sr., a technician at Gilbert’s Household Hazardous Waste Facility, pours latex paint into a drum mixing it with other paint that’s being recycled. 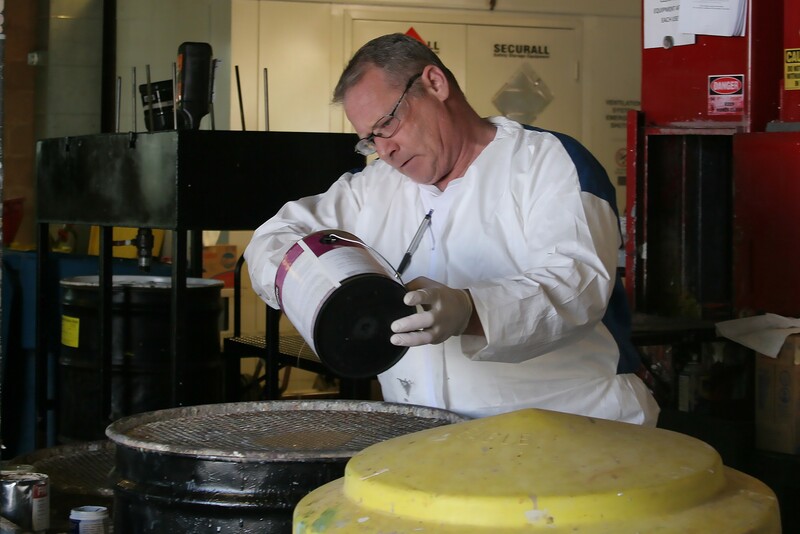 Rick Neiner Sr., a technician at Gilbert’s Household Hazardous Waste Facility, pours recycled latex paint into 5-gallon containers that are offered for free.